The Powder Downs townhomes for sale were built in the 1990s as relatively inexpensive homes filling in vacant land on the south side of Breckenridge. Any Power Downs townhoouse offers buyers a close-in second-home, or full-time residence at a good value. Powder Downs are a group of townhomes built close to Highway 9 in the Warriors Mark neighborhood where they would be convenient for locals who work in town and second-home owners who wanted an independent home, with off street parking and garden-level basements. 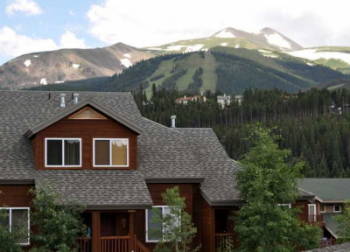 Want to learn more about living in this incredible Breckenridge development? Keep reading, or check out the Powder Downs townhouse listings below. The homes are clustered in threes, and there are six units all together, but each is individually owned and has a small private yard. There are two styles of Powder Downs homes, the smaller ones have two bedrooms and the larger, three. Neighborhood trails bring residents of Powder Downs into downtown Breckenridge which is a flat ½ mile walk, or to the start of longer trails that lead to the backcountry, such as Illinois Gulch, a town open space, that lead to the Blue River trail. The extensive system of trails in this area are popular with mountain bikers, hikers and cross country skiers. Amenities: individual homes, garages, close to trails, near bus route, is walkable to or from downtown. Go south through the most southern stoplight in Breckenridge, and take the next right turn, west and then left into Powder Downs Drive, and continue into the neighborhood. Do you have any questions about Breckenridge real estate? We are the local experts - email us or call us today.